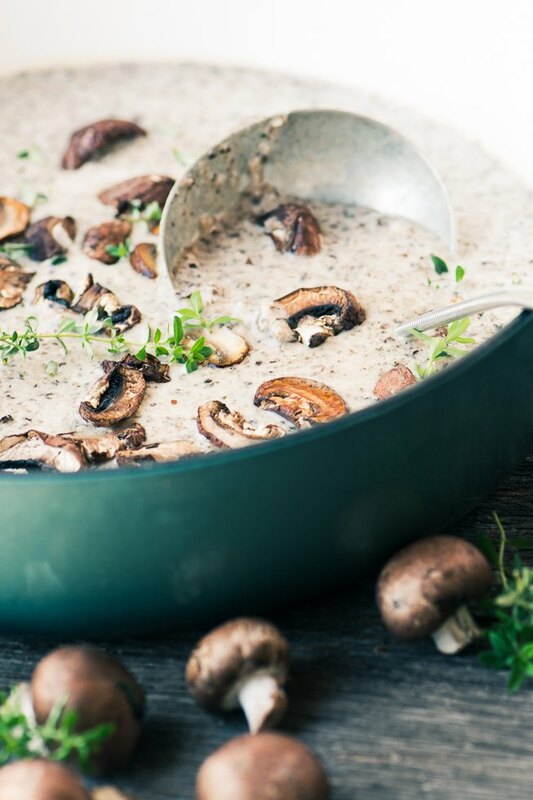 Mushroom and Brie Soup is a fall classic kicked up with creamy Brie cheese ~ perfect for a cozy dinner on the couch or a first course for big holiday meal. Brush the mushrooms with a clean dish towel to clean them, do not get them wet. Trim the stem ends, and then quarter the mushrooms. Put on a dry baking sheet and bake for 20-25 minutes, tossing them a couple of times. They will lose their moisture, shrink up, and brown. Meanwhile melt the butter in a large skillet and saute the shallots for 5 minutes, then add the garlic and saute another 5 minutes until the shallot has softened. Stir in the flour and cook, stirring, for a minute. Add the wine and stir to deglaze the pan. Add the stock, the mushrooms, and the fresh thyme, and bring up to a simmer. Turn down the heat, cover and gently simmer for about 15 minutes. Season to taste with salt and fresh cracked black pepper. Add the cream and the cubed Brie. Stir to melt the cheese. Puree the soup, in batches. Taste to adjust the seasonings, and add a bit more stock or water if it seems too thick. Serve with a garnish of sliced mushrooms and more fresh thyme.